Back in September, wildlife biologist Randy Cross shared some information about the new online game registration system being rolled out by his employer, the Maine Department of Inland Fisheries and Wildlife. Cross, who has studied bears for more than 30 years, heralded the new system that allowed him and other biologists to look at real-time data from around the state, rather than waiting months for harvest information that had to be compiled in Augusta and then eventually sent back to biologists in the field. 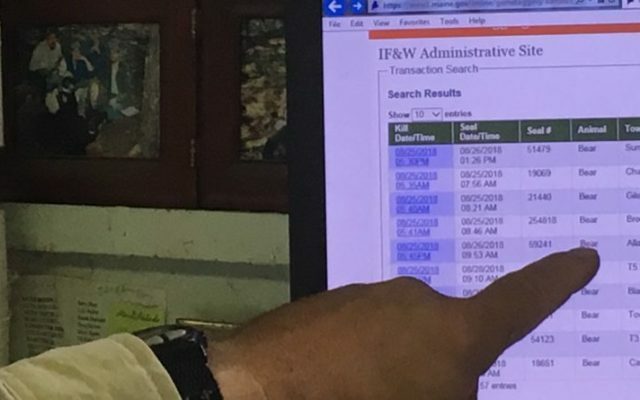 While some tagging stations have not made seamless transitions, according to some, we learned of another instance in which the online registration system has helped DIF&W personnel make timely wildlife management decisions. Earlier this week, a caller to the BDN sports desk advised us that deer in northern Maine had “yarded up,” or headed en masse into wintering areas. That action, the caller said, had made them vulnerable to hunters, and some hunters had entered those deer yards and found that they could take their pick of large bucks gathered in the woods. The caller went on to say that an effort had been mounted to advise the DIF&W about the problem, and to convince commissioner Chandler Woodcock to cancel the muzzeloading hunting season in northern Maine, which is taking place this week. At that point, DIF&W staffers made a judgment on whether the deer herd in northern Maine would be negatively affected by allowing the muzzleloader season to go on as planned. Digging deeper into the numbers via the online registration system, Latti said the DIF&W was able to learn that the deer kill in Wildlife Management Districts 1 through 8 — “northern Maine” — for 2018 has actually been lower than it was in 2016 or 2017. “We believe that [the deer kill] will go up approximately 5 percent during muzzleloading season, but that still will be lower than the 2016 and 2017 kill in WMDs 1-8,” he wrote. Earlier in the week, Latti had sent out a press release that illustrated another of the new system’s capabilities: Biologists had been able to instantly track the number of deer shot by hunters on Saturdays during the season, and correlate those totals to the weather on those key hunting days. More specifically, by monitoring the online registration system, biologists were able to determine that over the first two Saturdays of the season, the deer kill was almost 2,000 lower than it had been in 2017. The past two Saturdays, however, showed the opposite trend, with hunters shooting over 2,000 more deer than they had on the same two Saturdays a year earlier. In addition, the weekday totals for the last 10 days of the season were higher than the 2017 totals. Do you run a tagging station that is using the new online registration system? Like it? Hate it? We want to hear from you. John Holyoke can be reached at jholyoke@bangordailynews.com or 207-990-8214. Follow him on Twitter @JohnHolyoke.